So I have been collecting and repairing pins for a number of years. Never got into LEDs really. Always stuck with original. Just the other day I thought about fulllLEDs in warm white to keep the nostalgic color. I'd just like to hear everyone's opinion on LEDs and their pros and cons. I dont think its right to call the colors "Nostalgic". They are original, and as intended to be seen. Also remember that its not just about the color of the LED... but the kind of light spread. Leds generally do not produce as many lumens of light.. and the light they produce is very highly concentrated. This is especially a problem when looking right at them... or when under lit up artwork... you can see a very bright area hotspot. 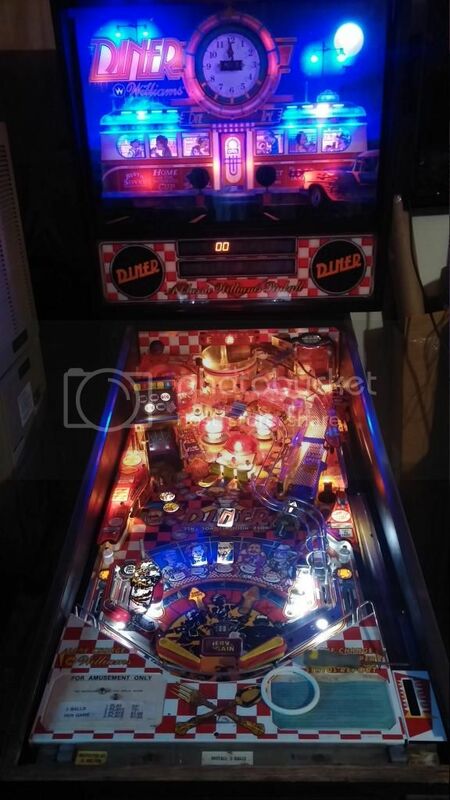 Ive seen great Pinball Machines butchered by LEDs. One was lit up with so much blue... that you couldnt even make out the playfields artwork colors at all. IMO, unless you put your games on route... where you do not have much time to change a few bulbs out... then stick with the standard lamps. I've used them on occasion in areas that are a pain to service ordinarily. Like in the back corners of the playfield, or in the pop bumpers on Demolition Man. I don't particularly care for the look in general and my experience has been that they strobe (or at least appear to) in certain games. In home use, the light bulb electricity cost and heat damage factor isn't really an issue. I'm pretty much in the same boat. I'll stick them in places that I never want to open up again. Inside the slot assembly on Whodunnit is a good example. You have to take the whole damn assembly off of the playfield to change the bulbs. Sometimes I'll use them under washed out inserts to restore the color when lit. F-14 has a lot of this and it can really help the blue arrow inserts. I'll use color changers for certain white inserts if the shot is important. If we're talking a white insert for Extra Ball, or the big scoring shot, etc then I'll use a color changer just to draw a little more attention to that insert. Not a super bright, I want the same level of light, but just that little touch of color rotation can draw the eye to that prompting insert better than just the plain white insert. LEDS can be good when done tastefully in older machines. I swapped 44's with frosted dome leds for backglass/etc and it looks nice. However, I also swapped the lamp driver board to negate the "flicker" pbj mentions. OTOH... you can do some fairly nifty 'upgrades'. I recently picked up a nonworking Defender. Defender uses a bulb length that isn't available anymore. The light transformer was bad (blowing tubes instantly) so I ended up pulling the whole light panel out. I got one of these LED strips from Amazon. Cut it to length to run around the perimeter of the marquee box about 4" back, used a random 12v wall wart connected to the original transformer's power connector (117v), and ended up with this. It took maybe 20 minutes once I had the parts in hand. Some interesting feedback. I like the idea of them being applied to GI in the difficult areas. Also faded inserts...another good point. Color changer in a big feature lamp even sounds like a neat mod. Thanks for the input. This IMO, is exactly what NOT to do. All the colors of the artwork are downed out by the Eye-Surgery "Laser-Blue". As for the BackGlass LEDs... Ive also seen this done. It ruined the artwork.. by creating very harsh Hot-Spots. As said, LEDs just do not spread the light out well enough. Use different leds. You make it sound like the zillion types of leds all display the same. First of all, it is extremely difficult to photograph a pinball machine with LEDs. Almost every pic I have seen looks a lot worse than the seeing the machine in person. I have LEDs in all of my machines now, and I would never go back. I am using the LED OCD (made by one of the guys on Pinside) board to smooth out the insert lighting. It looks fantastic. I am also using LE kits from pinballbulbs which include spotlights and LED strip lighting in addition to the bulbs needed for the machine. the whole playfield is nicely lit up, so the individual LEDs are not overpowering. AC/DC is well lit by design, and these kits really update the look of the older games so they fit in with the new stuff. The purples and blues are not anywhere near this harsh in person, but this is about the best I could do taking the pic. In person, they look great, even playing in a dark room. If you have seen AC/DC in person, you can tell the difference in how it is captured in the pic. It is a similar difference in the other pins.